Across the diverse fleet the American Cruise Lines keep surging in its new build program through the addition of new ships to its modern riverboat series and to its fleet of new coastal ships and Victorian –style paddle-wheelers. In the past two years, the cruise line has expanded exponentially and had introduced a new ship in 2017 and 2018. This summer the latest American’s new ship will get into service, two more new builds will come up in 2020 and 2021. The American’s fleet of US-built ships will come to 11 and in August the American Harmony will start its service on the Mississippi. The American’s fleet will surge in numbers and come to 15 ships by 2021. 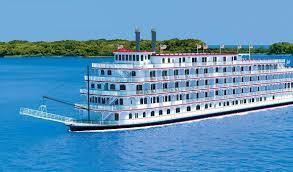 Last year in October the American Song, the first modern riverboat in the US started cruising and started to sail out west of Columbia and Snake Rivers. In 2020 the third modern riverboat will be completed and is currently under construction at Chesapeake Shipbuilding in Salisbury, where all American’s ships are designed and built. In the Modern Riverboat Series every ship has an underlying modern design premise, it is unique and different than the earlier ones.